Crossan (undisclosed) and the Buccaneers have reached an agreement on an injury settlement, per NFL Communications. 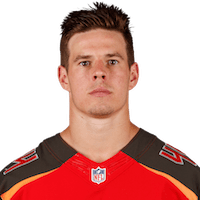 Analysis: Crossan's 2018 run with the Buccaneers will end the exact same way as it did with the Colts a season ago -- the fullback collecting an injury settlement and hitting the open market. He was vying for a roster spot prior to the injury in 2018, so there's still a chance he could do so when back on the field next season. There are no videos available for Dalton Crossan. Click here to view all videos.